"Lovers should guard their strangeness." Stepping out onto his balcony, Lord Elrond drew a deep breath, wrapped his hands around the carved railing, and stared into the fog swirling about the spires and graceful buildings of his beloved Rivendell. This was his favorite time of day, when the new-risen sun had not yet cleared the steep cliffs protecting his world, when it was still wrapped in shadows and light. Lamps were winking out below, the community beginning to stir after passing a quiet night -- all of the community, which included quite a few guests in residence. His mind skittered away from that thought and turned again to the realm he guarded, the Last Homely House East of the Sea; a place of refuge, a haven against the storms of Middle Earth. So it had been for hundreds of years. Fingers tightening on the balcony, Elrond grimly admitted the thought that teased at the edge of his mind, the one that refused to stay banished: how much longer could he hold this peace? How many more mornings would dawn in gentle beauty here? For all of the seduction and seeming stability of the morning, Elrond knew all too well that theirs was a deceptive, fragile sanctuary. Sauron's power had grown, was still growing, reaching now to the very borders of their small, carefully guarded place of peace. Only days before, his Black Riders had expanded their reach until they had threatened not only the Ringbearer, but Elrond's own fair daughter, Arwen. Strong-willed child that she was (defiant brat would be a better term, he noted), she had joined her brothers and the Elf Lord Glorfindel in the direct and dire confrontations happening just outside their borders. She had managed to vanquish the Riders temporarily with the help of a good horse and powerful magic made possible by her own Maian blood, but horses, no matter how great their hearts, and words of power offered no permanent victory over Sauron's evil. The darkness was now reaching far too close for anyone in Imladris to ever live in peace or safety as long the One Ring existed. And so Elrond had taken action. He’d formed a council and confronted the growing problem directly, as was his usual means of governing. They’d met with moderate success; actually, very little success. A course of action had been decided upon, but it did not in and of itself inspire great hope for the future, for greatest of conflicts was going to be engaged by a waist-high creature with no knowledge of the world, no combat skills, and a gentle innocence hardly compatible with the task he’d claimed. And as guardians? These were more equally unprepared little Hobbits, a Lord of Gondor who had disagreed with their plans from the start, and a dwarf who hated elves. Rounding out the group was an aged wizard, a king who wanted nothing to do with the throne and viewed the ring as a matter of shame to his family, and an elf who was probably more concerned with protecting the wizard and the Ranger than the One Ring. A truly splendid army to send fourth against Sauron’s power and Sauron’s trained army of thousands, Enrond thought. No, not an army: a Fellowship. It had been formed, had accepted the task to take the Ring to Mordor and destroy it. Forced by necessity and with no little desperation, and Elrond had confessed to Mithrandir his doubts for the Fellowship’s success. "We—hobbits and an elf, two humans and myself--are all that we have. All that are willing to shoulder this burden. What else would you have us do?" the wizard had replied quietly. "You forgot to include your dwarf. Don’t let him hear you exclude him from this task or he’ll shout down the walls in outrage. Still, with dwarf or without, this Fellowship looks woefully unprepared for what we met on the slopes of Orodruin. Not for the first time, and certainly not for the last, I find myself wishing that the Valar had sent one of their own to end this evil." The wizard smiled ruefully. "But then the citizens of Middle Earth would learn nothing." "I've learned well enough of destruction and death," Elrond growled. "How much more do the Valar feel we must learn, Mithrandir? How many more must suffer, and for how long? I can foresee no future for any of Middle Earth with Sauron." "Then perhaps, with the Fellowship's help, it is time for all of us to rid ourselves of the Dark Lord and his pain, and learn renewal and peace. That is something to look forward to, is it not, should we succeed?" Elrond remained silent, having already told the wizard that the age of the elves was ending. Come what may, his people would leave these shores. He would not witness any renewal or peace in this world. The success or failure of the Fellowship would be a legacy left to others. Elrond knew that Mithrandir maintained a quiet hope regarding the Fellowship's efforts, that the wizard would do everything within his power to ensure its success. But the Fellowship had been forged of a wary diversity of races, skills, experience and abilities. Whether it could make that diversity work for itself rather than against it, whether it could become an effective, cohesive whole was a question that remained to be answered on the road. Probably quite a distance down the road, considering how unyielding some attitudes seemed to be. Frodo continued to recover from the Nazgul wound he had suffered. Elrond was pleased with his progress and told the rest of the Fellowship so. "As yet, however, he is not strong enough for the journey ahead," he further relayed. "I therefore suggest that the rest of you take advantage of the calm before your storm and get to know one another." His gaze had rested on Gimli, who seemed to take the hint. The dwarf had growled softly when his father, Glóin, and his companions had taken their leave of him to return to the Lonely Mountain, but he had not complained about being left behind. He had, after all, volunteered for this. "Never trust an elf!" the dwarf had proclaimed at council, and Elrond grimaced to himself, knowing all too well that Gimli still felt that way. How unfortunate that he now finds himself surrounded by them, as he will for some weeks to come, thought Elrond in wry irony. Gimli was grumbly, but he was still making an effort to heed his host's admonishment to get to know the others in his party before they set out of the gate. The dwarf had even gone so far as to make an effort to meet his host every morning for breakfast, though Lord Elrond was not one of the Fellowship. He should be breakfasting with Legolas if he wishes to know more about the elf he will travel with, thought Elrond, but that seems more of an effort than either one is capable of in these sensitive early days. Here Gimli was now, having made his way up from the ground-floor rooms he'd requested of the lord, thumping his way through Elrond's silent, cavernous library, and out onto his balcony to stand at his side. It was a no-never-mind to the dwarf that the elf had long been accustomed to breakfasting in peace and privacy. Gimli seemed oblivious to such desires. Surveying the same pastoral scene Elrond was enjoying, Gimli hooked his thumbs in his belt and grunted at the sunbeams dancing their way through the mist. "It's too quiet here, Lord Elrond. Far too quiet." "I believe you'll find that elves enjoy quiet, Master Dwarf." "As dwarves enjoy a bit of a noise. Lets us know we're alive." His dark eyes glittered up at Elrond. "Each to his own, eh?" Elrond had discovered there was a quick mind behind those eyes. For all of his prejudices, the dwarf had sought out Aragorn, had counseled with him, and had been reassured by what he had found. "He's one of the strongest in our party," Gimli had announced to the Lord of Rivendell early after the Fellowship had been formed, as if he'd discovered one of the wonders of the universe. "I perceive that Aragorn is far more than a Ranger, as well. Seems to doubt himself a bit too much though." "He does. He's well-acquainted with the wizard, I notice. And with that glowing Legolas thing, isn't he? I don’t know about the elf, but neither the wizard or the Ranger would suffer fools easily, so if they approve of each other’s company at least those two must be fair to travel with." Gimli chuckled, as if sharing some great joke with the Lord of Rivendell. "Legolas has spent much time with the Rangers," Elrond volunteered, "while Mithrandir has long sought their service to aid his tracking the Dark Lord's minions and activities." "Gandalf's a respectable, sociable fellow. Not many in our lands who haven't heard of him," the dwarf offered with particular warmth. Apparently he did not hold the same ill feelings toward Mithrandir that he held toward elves. But then, it hadn't been a wizard who'd imprisoned his father. Nevertheless, Glóin himself had sat quietly observing during the council. It had been left to his son to make known his prejudices. In only a few days, it appeared that Gimli had realized that he and Boromir were the odd men out on this mission. The rest seemed to have broken down into two overlapping groups; the inseparable hobbits and the strange trio of wizard, Ranger, and elf. Softening his approach, he made an obvious effort to stop snapping at every elf that came along, but Legolas still steered clear of him. Would probably steer clear of him throughout the quest and beyond if they were both spared, thought Elrond. A good decision or poor, he couldn’t decide at this point, though today avoidance was definitely the more peaceful road. The elf lord's attention was drawn to nearby balcony, where Mithrandir was just emerging from the chamber he had long shared with Legolas. Sunlight glinted off of his tangled silvered hair and beard, and he'd left staff and robes behind to exchange them for the elven equivalent—probably at Legolas's bidding. Elrond noted with satisfaction that Mithrandir seemed to be more relaxed and was standing straighter than when he'd been delivered from Saruman's clutches and into Rivendell. It's not every day that a giant eagle delivers a wizard just outside of my windows, Elrond reflected. And not just any wizard, but one who had been bruised and all but broken by the power of the one leading his own Order. "I seek sanctuary," Mithrandir had gasped as he staggered off of the back of the eagle. He managed a few wavering steps toward Lord Elrond before adding the obvious and somewhat faint request, "I need your help." It had chilled Elrond’s soul to see the wizard so diminished, but questions had to wait. His friend had asked for help, and help he would receive. Elrond had been relieved to discover, once the tattered robes had been removed, once the blood and the dirt had been washed away, that Mithrandir's injuries had not been grievous. Far from minor, they were still not life-threatening, being matters that time and care would clear swiftly. Life-threatening had graciously waited until later in the day, after Elrond had been certain the first emergency had ended. His daughter, Arwen, had come clattering home atop Glorfindel's exhausted horse. Ignoring the usual riding paths, she had ridden straight into her father’s and up to the stone stairs where animals simply did not go, not stopping until Asfaloth’s forefeet were braced on the bottom step. Shouting for Elrond, she hadn't bothered to dismount from the weary, blowing creature. Her father had had emerged from his studies, flying down the steps with a heart that was pounding with fear, certain that his baby had sustained some terrible injury. Arwen's eyes had been wide with terror, her face stained with tears, but she was whole and mercifully uninjured. His heart had just started to beat again when she delivered down to him a shivering, mostly dead bundle of Hobbit that had all but become a Wraith, compliments of a Nazgul blade. And he still bore the accursed ring. Here, into his sanctuary home. His relief had been short-lived, indeed. Thanks be to Elbereth, both had survived, and both were recovering nicely beneath his care. Elrond had worried for awhile about the wizard more than the Hobbit, because it was plain that most of Mithrandir's injuries had been emotional rather than physical. Yes, he'd been battered about and subjected to the elements. His left hip had been badly bruised and his back as well. He'd been subjected to repeated blunt trauma over much of his body, left out in the elements and starved. These were all ills which Elrond and time could heal. Beyond all of that, the elf worried that the wizard's eyes were full of shadows and sadness that no elvish medicine could touch. Four words were all that Mithrandir had let go while the elf had tended him: four words, no more and no less, weighed down with sorrow and confusion. Mithrandir had shared enough over the years for Elrond to realize that the wizard had had lost a friend as well as an ally in the fight against Sauron. The elf lord waited patiently for more information, only to learn that Saruman had joined with the Dark Lord, was fashioning an army for his use, and showed every evidence of having increased Sauron's power threefold. Elrond knew it was unjust, given Mithrandir’s injuries of the moment, to point out that he should have noticed his colleague's falling into darkness. But the elf lord could spare the wizard’s feeling only so far: time was closing about them, their list of allies was growing far too short for anyone’s liking, and a solution to the One Ring had to be found quickly. As soon as Mithrandir had felt well enough to talk, they’d begun turning the problem round and round in the elf lord’s cavernous library. Gandalf had been agreeable enough to to the idea of a Council gathered by Elrond to consider the problem of the Ring, and so word had been sent to gather in the chosen attendants. Word had also been sent to Mithrandir's chosen companion, the one in Middle Earth who was closer to him than all others. Come, he had. Elrond had seen Legolas's arrival himself. Dismounting the moment he was within the walls of Rivendell, the elf had spun around and looked up, had searched the towers with sharp eyes that missed nothing and sought one being above all others. Eager blue eyes found what they sought, and Elrond could sense the bond surging between wizard and elf. Things seemed to feel better in general almost from that moment on. Elrond and the wizard had managed to end their latest meeting—barely--before Legolas took the steps up to the library two at a time. He had halted, barely, before the Lord of Rivendell to sketch the bow that manners demanded before going directly to Mithrandir. He said nothing, but scanned the wizard from head to toe. Mithrandir suffered the scrutiny, at first looking sheepish and then more hopeful before Legolas grasped him gently by the shoulders to gather him into a firm, yet gentle, hug. Hands had entwined, lips had met. There had been more hugs and loving words. The wizard had relaxed, the elf had shrugged out of his outer robe. And Elrond had retreated from his own library to give them a few minutes of privacy. Having Legolas close seems to be doing him a world of good, Elrond thought, but then, it always does. Gazing up at the higher balcony, the wizard saluted his watchers with a large mug of what was probably tea. "Good morning, Lord Elrond, Master Gimli," he called across the expanse. "A good morning to you, Mithrandir." "Tharkun," the dwarf grunted in acknowledgement. The wizard waved, then settled himself on the stone wall. Elrond sensed that most of the injuries he'd earned at Saruman's hands had healed. Even his limp had gone, leaving only a slight stiffness in the way the older man moved. That, too, should fade within a few days, if Legolas was tending his mate with the same gentle attention as was his usual habit, not to mention administering the daily massages with sweet oils that Elrond had recommended. Pulling at his robe so that it would not tangle about his legs, Mithrandir sat back against the wall. Elrond could hear his sigh of contentment as the sun found him, offering warmth and a particular reassurance all of its own. Legolas came to Mithrandir then, bounding out of nowhere and up over the balcony wall with an effortless ease that made Elrond glad to see it. While the wizard had slept, his elf had passed the night lost in conversation and song with Elrond and a few others in the Great Hall. He’d left only an hour before sunrise to tend his horses in the back fields and now returned to Mithrandir a bit damp about the ears and with his hair dripping. Stopped to bathe, did we? Elrond thought in fond amusement. It wouldn't do to return to our lover smelling of horse, would it? Going to his wizard, the elf leaned down for a quick morning kiss and all but arched like a cat beneath the large, callused hand that smoothed down his hair. Legolas then disappeared inside their chamber, only to re-emerge with his own mug of choice. Opening his arms, Mithrandir murmured something that even Elrond's sharp hearing could not pick up. Legolas nodded his agreement before settling comfortably on the wall and leaning into the circle of those arms with his back against the wizard's chest. Strong arms wrapped around him, urging him closer still. They've been together for more than two thousand years now, Elrond thought as Mithrandir rested his chin atop his companion's fair—if damp—head. Yet, I’m still amazed each time they let me witness any part of their special sharing. The next moment, a pang of loneliness struck deep within him. I miss you, my Celebrian. He sent the yearning into the ether, wishing that she could hear him where she was waiting, oversea. Wishing that he could touch her this morning as Mithrandir and Legolas were touching. On the balcony below, Legolas stretched his long legs in unconscious felinity and slid his hands down Mithrandir's thighs to drape his fingers over the wizard’s knees. Urging the elf to lay his head back on his shoulder, Mithrandir murmured something to Legolas. The elf replied in kind, gesturing shortly before letting his hand drop back down. He tensed when Gandalf breathed some private comment into his ear, only to relax when the wizard chuckled softly at his lover’s reaction and tightened his grip. Long elven fingers traced lazy patterns across Mithrandir's knee. Their conversation continued, with Legolas closing his eyes and relaxing into the moment. Elrond knew he should look away, but seeing Legolas so at ease was something not often witnessed. Only in private moments like these was it visible, and always it was only in the wizard’s company. Mithrandir’s fingers combed carefully through the thick, damp hair that looked, even wet, as if it had been spun from light. "He is not a child any more," Elrond remembered cautioning Mithrandir many years ago, when word of their joining had reached him. "Your elf has needs, and they're not those of a little boy." "Some of them are," Mithrandir had defended quietly, leaning upon his staff, his eyes filled with sadness and understanding. "Some of those needs will always will be." You knew what you were talking about, my friend, Elrond thought, remembering the first time he'd met the elven prince. How far we've all come since that cold, rain-driven night. And how different Legolas is with you than with anyone else in his world. How fortunate it is that you took him beneath your protection as you took him beneath your cloak that night. "Did I just see that elf kiss Gandalf?" Gimli demanded, all but forgotten beside Elrond. "What?" Incredulous, the dwarf strained over the balcony. The railing cut into his vest as he tried for a better look. Vines blocked most of his view, and Elrond bestowed a silent blessing on those vines. "He’s even stranger than I thought," Gimli grumbled, then fell silent for a moment’s contemplation of this new information. "I've noticed that Mithrandir and that elf seem inseparable, but what made him kiss him?" "They have known each other for a very long time." Dark eyes fastened on Elrond, suddenly wary. "Known each other, how? That elf’s not likely to kiss other acquaintances, is he?" "I don’t believe so." Elrond hesitated before continuing. 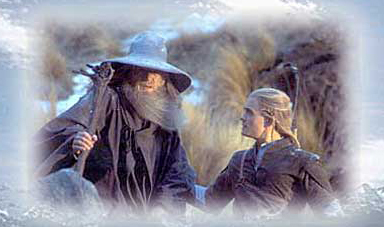 "What lies between Mithrandir and Legolas is not a tale for me to tell, Master Dwarf. If you wish to have your curiosity satisfied, you will have to ask one of them about it." Gimli scowled up at him, obviously knowing a stone wall when he heard one. Glancing back down at the couple still settled together on the wall, he grumbled. "As if those two would tell me anything I wanted to know." "Then perhaps you should ask yourself whether the answers are any of your business." Turning on his heel as protective feelings rose, Lord Elrond left the balcony and the dwarf in the morning sun. Elven hearing was sharp, and Legolas squinted an eye open as Gimli's query and Lord Elrond's reply wafted over the leaves. "The dwarf is curious about us." Mithrandir snorted. "Gimli and a half-score others at this moment." Turning his head, Legolas buried his nose in the wizard's beard and breathed deeply of its scent—all elven soap and another, earth-bound something that the elf had always associated with security and safety. "Elrond has deflected Gimli's questions if not his curiosity, but I fear the matter will come up again on our journey." "We will deal with his curiosity when it recurs, then." The wizard spoke mildly, having long ago become accustomed to being stared at and talked about because Legolas had chosen to bond with him. He remembered one conversation in particular, overheard in a Rivendell garden at night, centuries ago when the bonding had been new. The immediate result of their joining had been to create bewilderment and no little resentment among the woodland elves and beyond because such a worthy morsel had been snatched from them before they'd had any sort of chance to sample it. That the decision to be snatched had come from Legolas himself meant little to the green-eyed little elven monsters. And so it was that Legolas Thranduilion, prince of Mirkwood, had found himself defending his choice over and over again for many years. "Not to be cruel, but why would a young, beautiful elf like you want a tired old wizard like him?" a nubile young thing, caustic with the sting of new rejection, had sneered within Mithrandir's hearing on the night in question. Stone-cold silence had met her question for a moment, and the wizard had held his breath where he sat, hidden from the couple and dreading what he might hear. When Legolas had deigned to reply, his words had dripped ice. "Elven eyesight is failing you, for you see only his robes and his beard. Look again." My elf may be of few words, but he manages to make each one count, Mithrandir thought. Silence and dignity only are what he lets the world see of him. He ran a hand down the golden hair again and marveled anew that he alone had managed to breach the walls surrounding this elf to find the gentle, loving soul within. What a shame it is that no one else knows how beautiful he is, inside as well as out. "I am to meet Glorfindel and the twins for target practice in a few minutes," Legolas murmured, startling Mithrandir from his musings. The wizard disentangled his fingers from his elf's hair, only to have Legolas lean against his hand as it passed his cheek. "Will you come with me?" he asked. "Always." Mithrandir stroked a finger down that smooth cheek, caressing, and wondered anew that such a glorious, light-filled creature would crave his touch, much less want him in his life. Mithrandir exchanged his elven robes for something more suitable and certainly more familiar for one of his station, while Legolas gathered his bow and quiver full of arrows. The stroll from chamber to fields was made in companionable silence, but neither of the twins or Glorfindel were in sight upon their arrival. A hand to Legolas's elbow brought him around to stand before the wizard, who captured a handful of hair before separating a recalcitrant strand and observing quietly, "This needs rebraiding, else it could prove a danger." His eyes twinkled and Legolas smirked, which allowed the wizard to catch a glimpse of usually hidden, but much beloved, dimples. "How dangerous can it be, Mith, to practice with my friends?" Brilliant blue eyes captured Mithrandir's as a wash of love spiked through the connection they shared. "One can never be too careful. I don’t want to see any of this mane lost to your bow-string. Come, sit with me and let me take care of it." They settled at the base of a tree, with Legolas kneeling in the grass and resting the bow across his thighs. The silver-blond hair lay heavy in Mithrandir's hands, having dried to unorganized perfection, and the older man sifted it between his fingers. Deftly, from long practice, he pulled back the top portion and secured it with a series of threads snagged from his new robes. "Don't tell Elrond I did that, else he'll probably take back these new clothes." "If he does, I'll loan you my leggings." The wizard snorted at the thought of squeezing into leggings made for such a long, slender set of legs, and set to braiding the long strands of light at the elf's temples, back above his delicately pointed ears and down. Unable to resist, Mithrandir caressed the top of one elegant ear and was gratified when Legolas shivered. Glancing back over his shoulder, the elf murmured, "You enjoy teasing me, don't you?" "Very much." Snagging another thread from his robes, Mithrandir tied off the first braid and began the other. "I'd not tease if I didn't know you enjoy it as well." Moving silently and as one, Elladan and Elrohir stepped into the glade. Nodding a greeting but otherwise ignoring the couple beneath the tree, Elrond’s twin sons continued onto the field and began preparing the targets. "Good morning, you two," Mithrandir called after them. "Morning," one of them mumbled, not bothering to look back. Legolas shook his head and sighed. "Manners are wasted on those two, you know that." "Of course. It’s part of their charm." He grinned, knowing all to well what little value the pair placed in courtly graces. "They are undoubtedly preparing themselves to demolish you." Mithrandir finished tying off the second braid and slid an arm around his companion’s shoulders, the better to hug him tightly. "You're repaired now, my elf. Shoot well." "Do I not always?" The slight smile removed all possible arrogance from the statement. "Imp," he scolded, pushing at the slender shoulder. "Off you go." The slight smile flashed into a grin for just a second, and then Mithrandir was watching his elf stride away on legs that were long and beautiful, with a grace in movement that was singular even among Legolas's own race. Glorfindel appeared out of nowhere to match strides with the younger elf, who offered a slight, respectful bow to his former teacher as they joined their companions. Out came Mithrandir's pipe and a bit of Hobbit weed. Lighting up and puffing contentedly, he blew a smoke ring in cheerful reply to the scowl Legolas gave him when he scented the weedsmoke. The attention of all soon turned back to the purpose at hand, with Mithrandir watching Glorfindel's happy heckling while the competition grew more intense. Legolas and the twins shot silently, contented as always to let their arrows speak for themselves. They’re the worst conversationalists in Rivendell, those three, he thought. Barely a sentence to be had between the lot of them. But the four were also friends and warriors as well, preferring skill and action to socialization. Their session continued peacefully and was a far cry from the powerful, violent energy Mithrandir had seen these warriors display over the centuries. It wasn't as if any of these elves needed the practice, either. Mithrandir thought that they gathered whenever possible to share simple companionship and new techniques gained in battling orcs and the wargs. Perhaps they also just wanted to participate in what was, quite plainly, a master class complete with pointed critiques from Glorfindel, their oldest and wisest teacher. Legolas stood straight and confident, his bowstring taut and his cheek resting against the base of his thumb as he considered the latest difficult target Glorfindel had assigned him. As always, he made each shot look casual in execution and ridiculously simple to accomplish. Mithrandir had no doubt that his elf would hit the latest target as he had hit all others; his aim had long been an extension of his intent, and the arrow landed exactly where his will… willed it. Beautiful and talented, obstinate and honorable, fierce in battle, gentle in private, solitary but always at Mithrandir’s side… What a collection of contradictions this one was. That's mine, the wizard thought, letting the tree support his still-sore back. The golden beauty and lithe strength, within and without, that's standing just over there wrapped in sunlight and his own particular, radiant inner Light, is mine. No matter how dark our path may be or how dark our world may become, his light will always be beside me. He remembered the long-ago day they had met in Thranduil's stronghold deep inside of Mirkwood. It was a far cry and a long journey from that day to this one, yet in some ways it seemed to Mithrandir as if it had been only yesterday when he’d first locked gazes with those expressive blue eyes. The moment when a very small elf had managed to creep into the wizard’s weary heart, and had dared to open his own bruised little heart -- just a little -- in return. It was such an inauspicious meeting, Mirthrandir remembered. Just a set of huge blue eyes and a pair of scuffed-toe boots, hiding behind a tapestry…. Continue to the next story in this series.